Ricoh announced a new dedicated remote control for the Ricoh Theta. The model number is CA-3. It appears to be a wired remote that connects to the USB port of the Theta. I would have preferred a wireless one, to keep the cable out of view (plus one less thing to carry) and to be able to use it with the TH-1 hardcase. 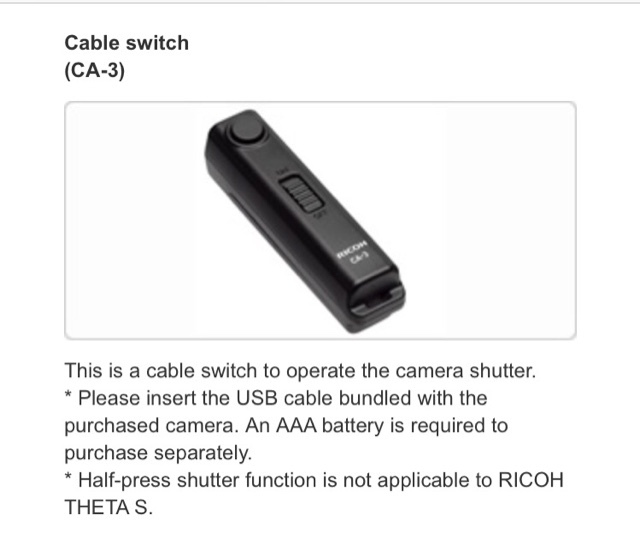 I suppose I will still have to use the Theta mobile app to trigger wirelessly (or use the self-timer).